Thread: I need some Help! Life should not be a journey to the grave with the intention of arriving safely in an attractive and well preserved body, but rather to skid in sideways, chocolate in one hand, WINE IN THE OTHER, totally worn out and screaming "WOO HOO, what a ride!" Lots of ideas in this google search I did. I just did a quick search and found these. Very nice of you to make a stocking and starting now not rushed to finish. You can just draw out a stocking shape and then start putting pieces of fabric on it like you would for paper piecing only in a crazy quilt design or whatever design suits your fancy. Then "quilt as desired" , add a back piece and lining, bind and make a hanging loop and you're done. Works much like making a tote bag. Very easy! Oh, you do want to make it a bit bigger than you think you need to in order to allow for the bulkiness of the quilting. Last edited by mom-6; 06-17-2013 at 11:51 AM. Oh that elf boot one in the Google pictures is adorable!!! Thanks everyone. I'm better with a pattern I can follow and would like to appliqué something like Santa or a snowman on it and that's what I'm having trouble with, finding the Santa or snowman pattern. I'll guess I'll just try to find pictures on the internet and draw it myself. I did a number of stockings by taking a block that I liked and making a good sized piece of fabric of that block, then cutting out a stocking shape, layering and quilting. Use the first one to cut the second for the other side of the stocking (don't forget to turn over for back) and use the binding to put the sides together. You can use any simple block and Xmas fabrics and it'll look great. I probably shouldn't post the ones I made a few years back, because I didn't keep the name of the pattern. (but I will post so it might also give you an idea) I had collected some tartans on a trip across Canada so used them as the scarves so we each have one with a little different design. I used a plush fur fabric left over from a snowman wall hanging made years ago for the rest of the stocking and they are lined. Thanks Ladies for all the new sites. Could you just draw around a pattern you already have (allowing for seam) and cut it out of christmas fabric? You could use a coloring book to make templates to add a few shapes or some fabric is so pretty you don't have to do much. I think the one I made my grandbaby last year was just pretty christmas fabric and I put his name on the cuff. You will figure it out and I am sure it will be appreciated. Anything handmade is special. Good luck. Show us a picture when you finish. When life gives you scraps, make a quilt. A preprinted stocking fabric is the pattern I use for Christmas stockings. Cut the stocking backing fabric larger than you need, piece the stocking front, quilt, embellish, quilt then trim to the corect size. Thanks for all the links posted! Look at childerns coloring books, here dollar stores have cheap ones and you can make all kinds of neat patterns with pictures, they are usually simple enough for applique. My favorite way to find Christmas pics to add to stockings or wall hangings is to use coloring books. The pictures are usually the right size, just an outline and can be used for an applique pattern as well. Last edited by SMR; 06-19-2013 at 07:41 PM. Thankful to still be here.Someone upstairs must still have a plan for me. I would use the same pattern you used before for the shape of the stocking (assuming you're pleased with it). Then you can piece fabrics so that they cover the surface of that pattern, using whatever pattern you want, or quilt your own fabric with any pattern you want. You can embellish it with applique or anything else that you like. 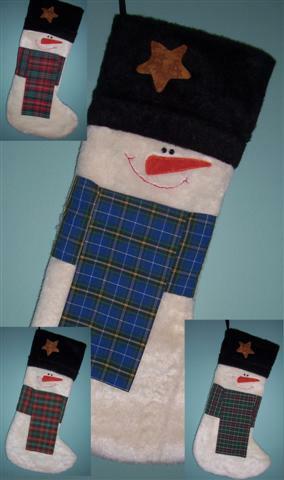 Google "Free snowman applique patterns"--some really cute ones. Could also do the same thing with "Free Santa....." I suspect. If the request was made because she had seen the sequin ones you made, you could probably add a few sequin snowflakes or crystals to sparkle it up! I never thought of the coloring books. I think that I'll check some out and that should give me some great choices. Thanks so much for the ideas. I do have a stocking pattern but was having trouble finding patterns for appliqués. Thanks again, I knew you gals would be a big help.